Zdravko Jelušić, the President of the City Assembly of Novi Sad, and Marko Radin, Chief Executive of the City Assembly, received today the members of the Norfolk/Norwich – Novi Sad Friendship Association, led by the honorary citizen of Novi Sad, Peter Beckley. 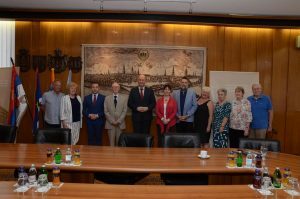 Today’s visit to the Assembly is one in a series of visits of English friends to the city institutions, and the President of the City Assembly of Novi Sad addressed them by wishing them to feel like in their city because that is what Novi Sad is. – We are always at your disposal, and Novi Sad is your city as well – said the President of the City Parliament, Zdravko Jelušić. 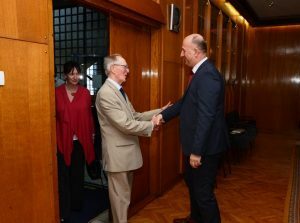 The honorary citizen of Novi Sad, Peter Beckley, said it was always a pleasure to stay in Novi Sad, adding that he was “very grateful to have the opportunity to meet with local people” and “among friends again”. During their stay in Novi Sad, the members of the Association of Friendship visited the Elementary and Secondary School “Milan Petrović“ and School of Music “Isidor Bajić“ and one of the Association members, Wendy Quinn, extended appreciation for knowledge and efforts of pupils of the School of Music. – The pupils of “Isidor Bajić“ School, who have had guest performances in Norwich over the past few years, have shown fascinating gift and talent for music. It is always a pleasure to listen to them – said Wendy Quinn. Among the guests from Norwich there were those who visited Novi Sad for the first time and Bob Young talked on their behalf about the impressions pointing out that their visit to Novi Sad “exceed all the expectations“. – We are here for the first time. We are truly surprised by good vibrations and atmosphere in the city that I could compare with the one of Paris. People are very friendly – said Bob Young. Peter Beckley confirmed that the city looked nicer and better regulated every year and the President of the City Assembly, Zdravko Jelušić, emphasised that the City administration was doing its best to raise the infrastructure in Novi Sad to the highest possible level. City for the titles of the European Youth Capital 2019 and European Capital of Culture 2021. I would like to assure you that within a year or two Novi Sad will regain its glow that it used to have because it has always been known as the cleanest city in Serbia – concluded Jelušić. Members of the Association thanked their host for a warm reception and during their visit to our city they will also have meetings with representatives of OPENS 2019 and Novi Sad 2021 Foundation.